NORTH MIAMI BEACH -- When you walk into Peter and Debbie Orlowsky's home, it seems a perfectly fine condo, until you look outside and see the balcony to nowhere. It's just a slab of concrete jutting from the building with no railing six stories above the parking lot. 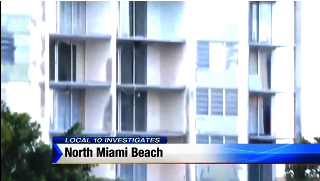 It's one of dozens of condos at Jade Winds in North Miami Beach that have unusable sealed-off balconies for years, and it's just the beginning. The place seems to be going to seed, with large cracks in some buildings, a general state of disrepair, and the historic office tower that has been the pride and joy of the community empty and condemned from neglect and failure to pay rent. Recently, the condo association filed for bankruptcy in federal court claiming more than $1.5 million in debt. "They ran it down to the ground," said Debbie Orlowsky. "It's all full of mold because they didn't pay the rent there. We're bankrupt. I don't know what we're going to do. There's people here with children, and there's families. There's 916 apartments here and they didn't care. They had no heart, no soul." Former Broward Sheriff's Office Deputy Santiago Perez now lives in a $630,000 home in Boca Raton. Orlowsky is referring to former board president and former Broward Sheriff's Office Deputy Santiago Perez, his wife Revital Sharony and former condo manager Donna Mantin, whom current board members claim drove the condo into bankruptcy. Criminal complaints have been filed against them alleging that hundreds of thousands of dollars in controversial all-cash parking fees levied on guests that were collected under their leadership have vanished. "There wasn't deposits made into the bank," said Peter Orlowsky, a member of the board who filed a criminal complaint in the case. Records also show that at the end of Perez's time as president last fall, he began writing large checks on the Jade Winds account to cash, adding up to more than $800,000. Perez claimed to pay major condo bills with the money, but now the board is facing the difficult task of trying to account for all the money. In a statement to Local 10 News, BB&T Vice President David White confirmed the bank was conducting an internal investigation into what he called a "very unfortunate situation for all those involved." When Santiago and Mantin left their positions last fall, board members were able to obtain emails and credit card statements of Sharony, Perez's wife, who is a former Margate police officer. What they found shocked them. The credit card bills, according to criminal complaints, showed that more than $170,000 had been deposited into Sharony's account in an 11-month period, indicating a lavish lifestyle some board members believed couldn't be sustained by two retired police officers. Nearly $20,000 in cash was deposited in the account in one 12-day period, the billings show. Also in those credit card billings was nearly $60,000 paid in dental bills apparently not for Sharony or Perez, but for Donna Mantin, the condo manager who at the time was employed by FirstService Residential. The emails showed that Sharony was representing Mantin in negotiations with the Gentle Dental Group of Pembroke Pines over the billings. "I'd like to resolve this so Donna's treatment can resume, since her condition is deteriorating due to this delay and it is urgent that she receives care," Sharony wrote to the dental office. In another email, the dental office manager complains to Mantin that she has "been trying to reach Revi for weeks now since she take care of you finances to give both of you information on your account." These findings outraged several residents, one of whom confronted Mantin in a parking lot on videtape. "Do you know how much damage you did?" the resident asked her. "Spending thousands of dollars for a dentist, getting your teeth fixed with our parking fees?" While there may be a legitimate explanation for the large amount of money going through Sharony's credit card account and her payment of such a large sum of money on behalf of Mantin, it wasn't forthcoming. Mantin refused to speak to Local 10. Perez and Sharony moved out of their modest condo to buy a $630,000 home in a gated community in Boca Raton. 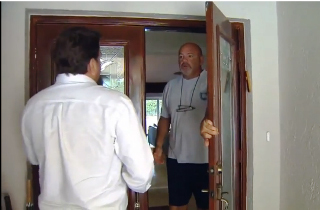 When Local 10 investigative reporter Bob Norman caught up with Perez there, he shut the door without answering any questions that the residents at Jade Winds so badly want answered.